Afallon is a substantial stone-built farmhouse dating from 1871, and commands uninterrupted panoramic views over the village of Aberdaron and towards the southwest over Cardigan Bay. 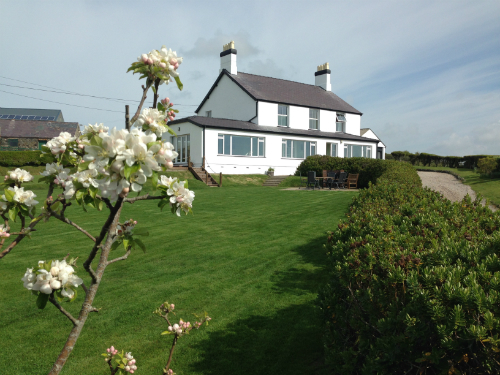 It is situated in an Area of Outstanding Natural Beauty in one of the most picturesque locations on the North Wales coastline, and offers modern and comfortable family accommodation. The house is set within its own enclosed hedged garden about ten minutes walk from Aberdaron village, with its safe sandy beach, shops, cafes and pubs, and there is excellent walking all around, particularly along the North Wales Coastal Path. The house can accommodate comfortably up to 14 people in six bedrooms (plus 2 infants, if they are in cots). Please visit the Accommodation tab to find out more, or visit the Facilities tab for details about the house and what is available.